Grey Poupon, widely known to be the condiment aisle's fanciest dijon mustard, isn't just snooty its advertisements. The brand's Facebook page actually screens Facebook profiles before accepting friends into its "members only" social circle of fancy fans. The Society of Good Taste (as they call themselves)is a "discerning Facebook page dedicated to the spread of good taste." "This society is a private club committed to upholding the pillars of good taste set by our mustard. Only applications with the most discerning palates will be admitted. Those whose applications are denied will have their LIKE rescinded." You cannot even LIKE their mustard, if you don't...erm, "cut the mustard." I applied, thinking, surely, I would be Grey Poupon material. My profile is mostly tame, fairly friendly-seeming. What could they count against me? The profile review-process itself is a cute little animated pageant of sorts. They pulled up various items from my Facebook timeline—photos, events, friends, posts—and commented on them, as judgey judges do. 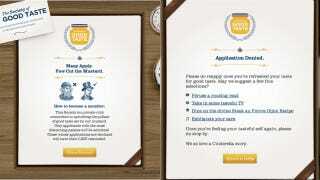 Update: I reapplied shortly after and was accepted! I guess Grey Poupon isn't as discerning a social club as we thought!